San Antonio gave up a ton of threes, a boatload of shots at the rim, and lost by a large number of points for a second game in a row. Clint Capela staggered as he snagged Bryn Forbes’ foot in the first of roughly a thousand forays to the basket in the Rockets’ 136-105 win over the Spurs. He regained his balance, got the foul call, and the Rockets promptly scored to go up 2-0. A few minutes later, DeMar DeRozan fell to the floor while trying to dribble between his legs, losing control of the ball in the process, and was called for a tripping foul — later upgraded to a flagrant 1 — as he kicked up his leg in frustration to thwart the Houston fast break. This is all to say: there’s more than one way to stumble. And while the Rockets and Spurs both floundered into their matchup under .500, the former losers of 4 straight, the latter 9 of their last 13, one happened to neatly collect itself while the other landed on its backside yet again. One night isn’t enough to change a season’s course, but it can help a squad catch its balance and build positive momentum for the long road ahead. That appeared to be the case for the Rockets, who welcomed Chris Paul back from injury after missing three straight during their skid. He didn’t put up the gaudiest line (14 points, 10 assists, 5 rebounds), but he gave an already-limited Spurs defense another talented ball-handler to contend with. Combined with James Harden (23 points, 10 assists, 7 rebounds), San Antonio had its hands full going around screens and trying to stay in front of them on the perimeter. That left plenty of opportunities for Capela (27 points, 12 rebounds, 4 blocks) to feast rolling to the basket and off the offensive glass (8 of his boards were on that end) and shooters like Eric Gordon (26 points) and Gerald Green (11 points) to capitalize off open three-point looks. The Rockets collectively made 22 treys after going just 9 of 41 from distance their first time in San Antonio. Watching from the end of the bench was Pau Gasol, spruced up in a grey suit with brown elbow patches and donning a boot on his right foot that has been declared “soreness” by the team in its injury reports, then called a “stress fracture” by Pop a few days ago, then reverted back to “foot soreness” in Friday night’s injury report. There’s a time to focus on syntax, but this team has enough issues right now as it is. Gasol is certainly a missing ingredient in a Spurs offense that Pop called “discombobulated” after the game, a word that could be applied to any number of possessions for the Good Guys. In the second quarter, they struggled three times in the span of a few minutes to inbound the ball from the sideline. Later on, Rudy Gay would thread the needle in between two teammates with a pass that ultimately went to neither, one of 13 turnovers on the night. Throughout, kick-outs from double teams led to empty passes and contested looks, and the team struggled to cobble multiple offensive possessions that resulted in quality shots. A stuck-in-the-mud offensive performance is a tough hurdle to overcome on an average night, but on one where your opponent goes 22-from-54 from beyond the arc, it typically spells disaster. That’s the area that will remain a concern for San Antonio, who hasn’t been worse than 11th in defensive rating since the 1997-98 season. 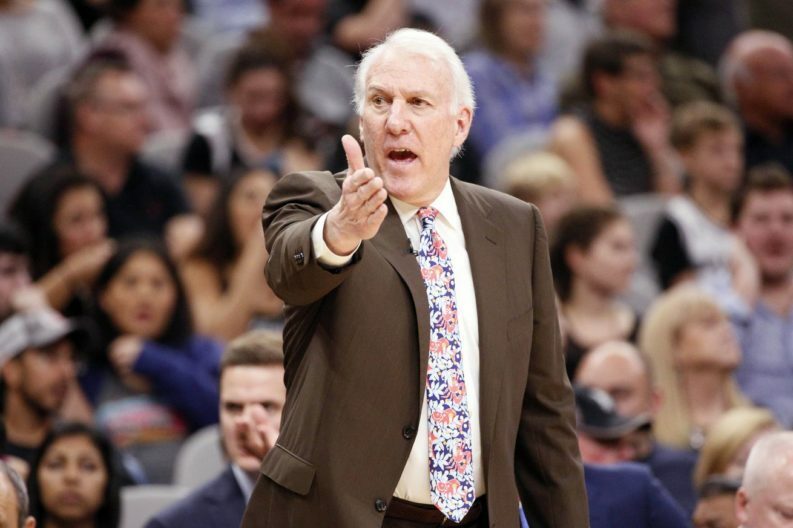 “Defensively,” said Pop in his 30-second post-game talk, “We’ve obviously got to shore up our effort and wisdom on that end of the court.” Fans will have to wait and see whether addressing those two factors is enough to bridge the chasm of where this team is at to where it wants to be. That’s the response DeRozan has to give as a leader on this team, but it’s still a fair summation of where the Spurs are at after this one: another stumble suffered, yes, but no signs yet that their direction or resolve have broken. Aldridge scored a team-high 20 points, marking the first time the Spurs have lost with him eclipsing that mark in the 10 games he’s done so. It’s this blogger’s stance that he still embodies the team’s ethos, for better or worse, now and moving forward. “It’s not the way you wanna start it, that’s for damn sure,” said White (11 points, 9 assists, 5 rebounds) of San Antonio giving up a 39-point first quarter to Houston. Through 21 games, Coach Pop has not received a technical foul. A short while later, DeRozan also added his name to the list of Spurs with technicals, but Pop takes his clean sheet into game 23. In previous seasons, we’d occasionally be treated to a quintessential Pop tirade, one that seemed less reactionary to the referee and more to serve as a spark to his team. For those groups, that might have been enough to get them over the top and propel them to victory. In 2018-19, that’s not yet the case.